Kids and adults will love racing each other through the log obstacles, rock climbs, crawl through tubes, pop up obstacles before climbing the final rock wall and sliding down the slide for the finish of the Adrenaline Rush Obstacle Course. 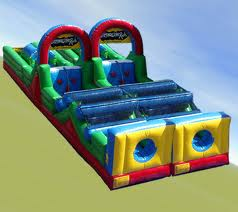 It is most popular for school fun days, colleges, and graduation parties. It is also suitable for kids as well. 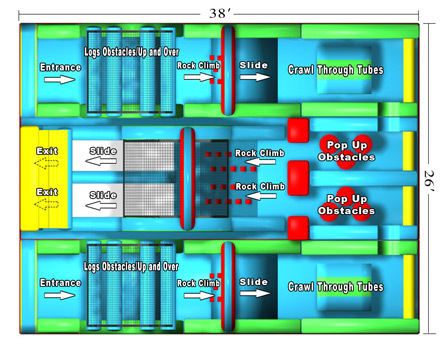 The Double Rush Obstacle Course Rental is the two outside pieces of the Adrenaline Rush making it also popular with schools, colleges, graduation parties, and older kid birthdays. Most popular for the younger crowd is the Backyard Obstacle course it is forty feet of pop up obstacles, rock wall and crawl through tubes.